If there’s really an all-natural way to build your muscles, it would be building it with your survival instincts. Before the exercise machines, before the best muscle-building supplements, even before workouts became a norm, men were able to rely on their body’s natural growth and development to build strength and muscle mass. Men are natural hunters. For thousands of years, men were able to survive by feeding off of hunted animals. To survive, men needed to develop speed, agility and strength from their muscles, and that’s exactly how our body naturally works. When in danger, your body shifts to its fight or flight mode, which activates your adrenaline which pushes more blood to your extremities. The rush of blood enables the body to be faster and stronger. This also enables the body to recover faster, which in turn develops the muscle to be bigger than ever. So what does this have to do with bodybuilding? The human body hasn’t changed so much for thousands of years. 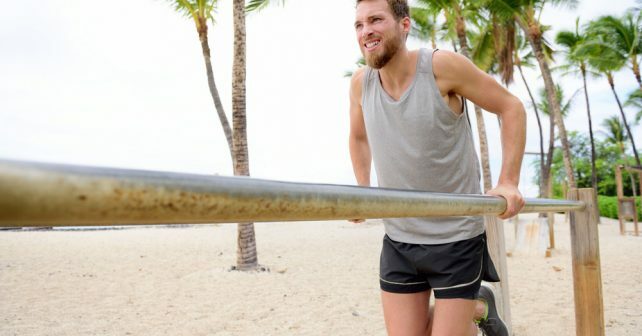 Your body can still utilize your natural survival mode to help build muscle mass. The real question is how. Here’s one thing for you to think about: Do you know any adrenaline junkies and thrillseekers that are out of shape? Probably none, right? That’s because adrenaline keeps your body in check. Getting an adrenaline rush is just today’s version of our natural survival mode – but it doesn’t mean that you’d have to be a thrill-seeking adrenaline junkie to build muscles fast. All you need is to stimulate your body in a way that mimics the effects of your body’s natural survival mode, and you’ll build muscles in no time. How do you do it, exactly? The rush of blood to your muscles is what makes your natural survival mode helpful for muscle mass development. The increased amount of oxygen and other nutrients carried by your blood to your muscles ultimately improve the strength and recovery of your muscles. By increasing the capacity of your muscles, you can train with more intensity, and do longer training workouts. – but how do you increase amount of blood going to your muscles? The secret is in nitric oxide. Nitric oxide is a natural vasodilator created by your body that dilates your blood vessels so more blood can flow through them. More blood, more oxygen. More oxygen, more energy – more energy, longer and more intense workouts. It’s a domino effect that ultimately leads to muscle mass development. How could you get enough Nitric Oxide to have a significant muscle-building effect? There are certain food that would increase your natural nitric oxide production, but you can get the most benefits by taking supplements that increase nitric oxide production in your body. The best muscle-building supplement I’ve ever come across is NitroGenix 365, which contains high levels of A-AKG (arginine alphaketoglutarate) and AKIC (alpha ketoiscaporate). These nutrients act as nitric oxide boosters and energy boosters for your muscles. A-AKG dilates your blood vessels to increase nutrient delivery, and A-KIC gives your muscles more energy to do more intense workouts. These ingredients simulate your body’s natural survival mode, which leads to muscle development. These 1-2 punch in muscle-building nutrients are extremely helpful especially for people who train with specific targets. I have personally reviewed NitroGenix 365 and found it to be one of the best muscle-building supplements in the market today. Just keep in mind that supplements only fight half of the battle for you. It’s still up to you to train intensively to gain the body that you want.